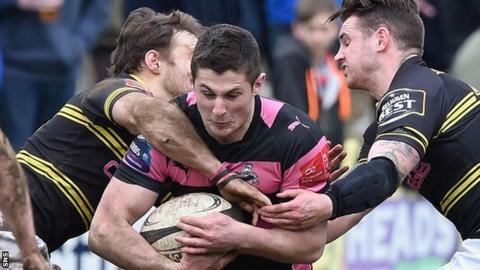 London Scottish have handed Robbie Fergusson a permanent contract after the 22-year-old centre impressed on loan from the Scottish Rugby Academy. Head coach Peter Richards said: "Robbie has been hugely impressive." Fergusson broke into the first team at Scottish Premiership club Ayr aged 17 and made a couple of appearances for Pro12 club Glasgow Warriors before joining London Scottish in November. He has become an ever-present for the English Championship club. Scotland Under-20 cap Fergusson, whose side sit ninth in the table, said: "I know that I have areas to improve. "But, with game time, I will hope to be as influential as I can be. "It's a great environment for me to improve and become a better player."